Wow! It’s another two Liebster nominations, this time from Amanda at A Year in the Life and Cassandra at Powered by Bling – THANK YOU! For those of you who haven’t heard of this award, it’s an award given by bloggers to bloggers. It was created to recognise relatively new blogs or those with <2000 followers. There are variants on the rules, so I’m just going to merge the two sets of rules as I’m a little short of time now! Go to their blogs and notify the nominees. So, here we go with my facts and answers to both sets of questions! 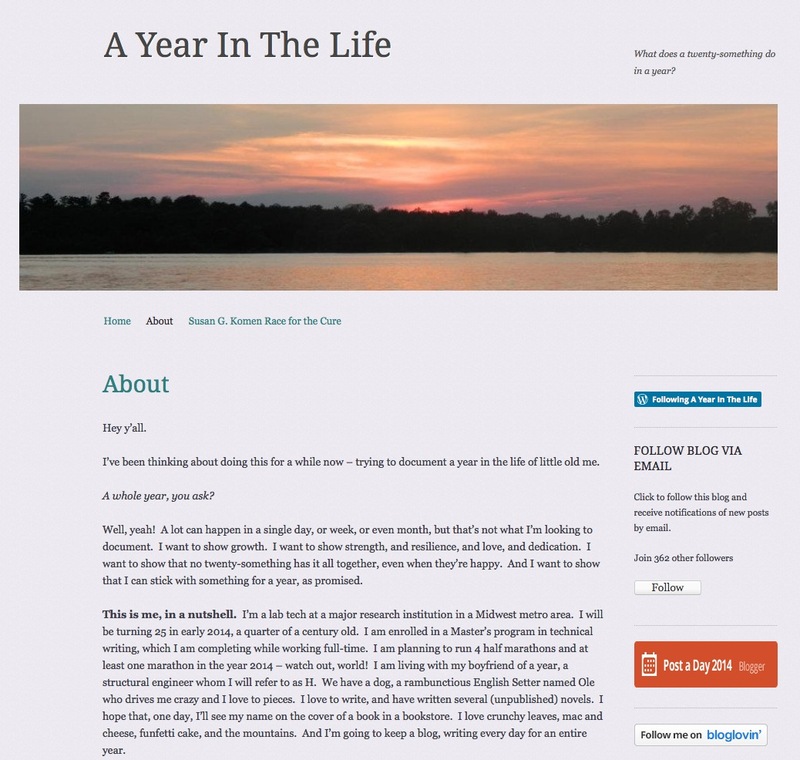 The first set of questions that I’m going to answer are from Amanda at A Year in the Life. 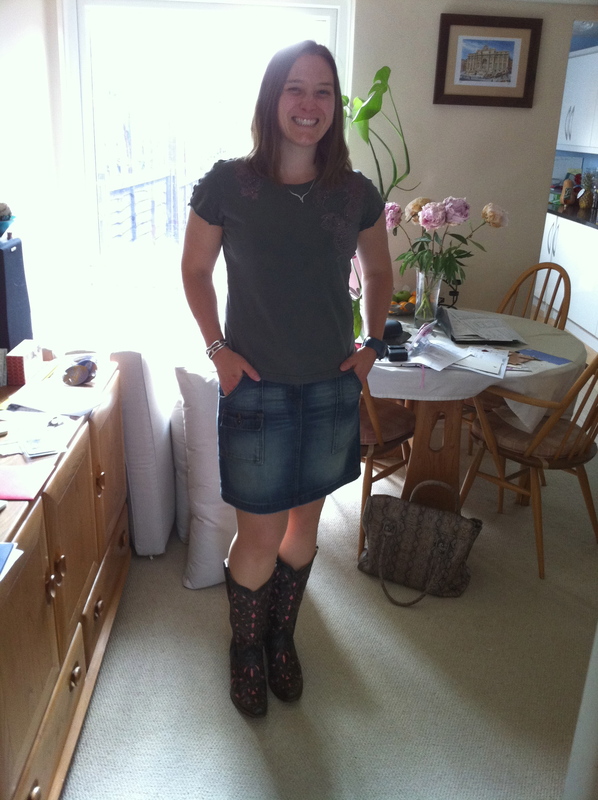 Amanda’s blog covers an eclectic mix of topics, including playlists for running and her efforts to become a professional writer. That’s a tricky question… it would depend on whether it would be a permanent move or just for a year or two. For a long time, I was desperate to work in Japan, but I never made it there. I spent three days in Tokyo in 2008, and am planning to go back there next year for a cycling holiday. However, I think the pace of life in Tokyo would be too hectic for me and I couldn’t cope with the tiny accommodation. I enjoyed visiting my brother and sister in Australia and really liked the laid-back lifestyle in Melbourne. I also really liked Barcelona when I was there. In reality, I hate change, so I’m quite happy where I am in Southampton… but I wouldn’t mind a larger house with a big garden and a swimming pool! Hmmm… that’s another one that I’m not sure how to answer. I like Brooks shoes for running, and I wouldn’t exchange my TeamSOAS kit for training/racing. SOAS shorts are the comfiest ones that I’ve ever worn on my bike. I wear a lot of Gap clothes for work and I love Ted Baker clothes. I also love my two pairs of Corral boots. It might take me all night to answer these questions. I used to teach Film and Media Studies, so I’ve seen a lot of films. Films that I like include La Haine, Chungking Express, The Happiness of the Katakuris and Unforgiven. I like most of Clint Eastwood’s movies. I also enjoy musicals, with the exception of Chicago. I quite like Big Bang Theory and used to love watching Big Love. One of the books that had a big influence on me as a teenager was The Outsiders by SE Hinton. It was sent to me by my German exchange partner, Alexandra, and I love it so much that I memorised huge chunks of it. I really enjoy a good yoga class and dancing makes me happy. If I’m on my turbo trainer, I find Wake me Up by Avicii to be quite motivational, but I’m a huge fan of Luke Bryan (who is relatively unheard of in the UK as most people here don’t listen to country music). I’m torn between choosing Do I and Someone Else Calling You Baby. I can often be found singing along to those in my Fiat 500. A question I can’t answer. I don’t read any celebrity blogs! I love summer as I like being able to spend more time outdoors… but I run better in winter when the air is cold, and I don’t overheat. I drink more water than anything else but like to indulge in hot chocolate. I very rarely drink alcohol, but I do like the taste of gin. …and now onto the questions posed by Cassandra. 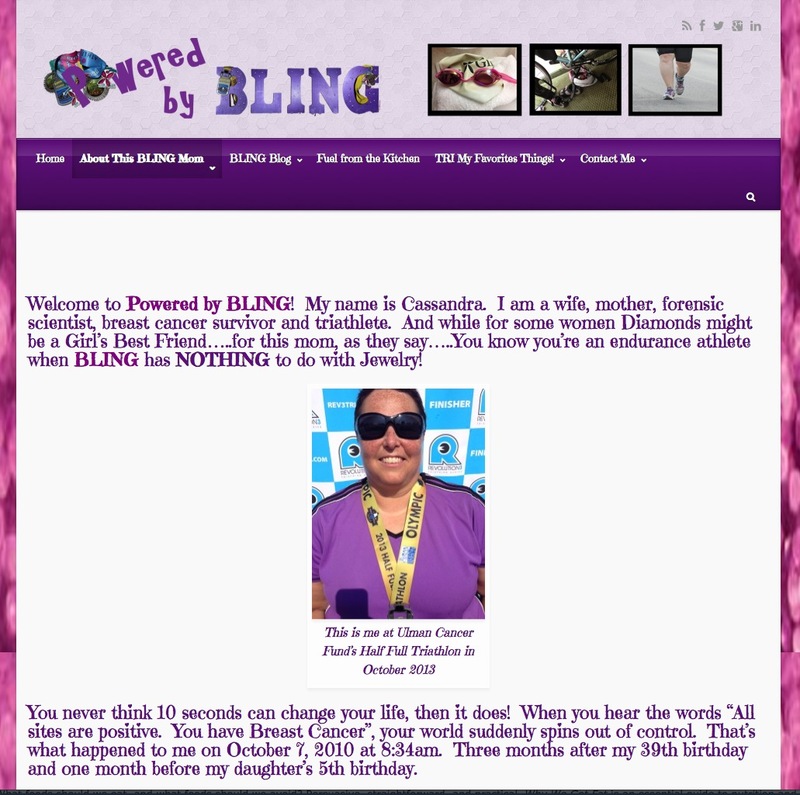 Please check out her blog, Powered by Bling. Cassandra is a super-inspirational blogger who has overcome cancer and is now a triathlete – way to go! I’ve just finished The Help by Kathryn Stockett, which had me hooked. I’ve not seen the film. I wanted to change my life and thought that writing down my goals and making them public would make me feel more accountable. Completing an iron distance triathlon. What is one of your greatest life or fitness accomplishments? That a tough question. I’ve achieved quite a lot academically (11 GCSEs; 4 A-levels; HNC; BA (Hons. ); MA; PGCE…), but I’ve never found studying particularly difficult. I’ve never been very good at physical activities, so I was hugely proud when I won a progress award at my dance school and followed it up by getting my highest ever mark in my next tap exam, which was also higher than the rest of the class’s marks! Logically, I should say that it was either competing in the British Team Gymnastics Championships, as I’d only been doing gymnastics for 2 years at the time. Or, it would be one of my karate achievements: winning national tournaments, achieving my black belt or competing internationally. I don’t have a favourite blog post, so it’s probably easiest if I say which posts readers have liked best. Unsurprisingly, the About page on my blog is that one that has received the most traffic, with the other pages also being visited fairly frequently. Aside from those This might be the most exciting thing that has ever happened to me is the most popular post that I’ve written. Should I change my name? also received a lot of comments, both on my blog and on Facebook. Name one thing/item that you could not go a day without. I’ve achieved fame on the Team SOAS website! What goals do you have for the remainder of 2014? If you could go on an all-expense paid travel for a month, what would you do? I think I’d probably have to put my private jet to use, as there are so many places that I’d like to visit. I’d want to visit my brother and sister in Australia and would hope that my mum and my husband could come along. I’d also like to spend a few days in Japan as well as relaxing in the Caribbean for a few days. I like country music, so I’d want to visit Nashville. It would also be good to pop over to Geneva to visit a school-friend. I’d like to see Moscow and would hope to be able to take in a local parkrun and catch up with Elena and Alex, who I met on my last triathlon holiday. It would definitely take me a lot of planning! Tell us something we might not already know about you that you would like your followers to know about you. I try to be completely honest in my blog posts, but negativity is never motivational, so if I’m feeling down, I tend not to post. I love pugs, but don’t have any pets. My parents bought their house in 1975, just after my older sister was born and my mum still lives there, so I never moved house when I was growing up. I’m a Professional Specialist in Learning Design. I did karate for five years and reached black belt level. Both of my siblings have emigrated to Australia. I don’t have any children but have 4 nephews, 2 nieces and a god-daughter. There’s too much of a risk that I’ll faint and drown so I never have baths! I was recently diagnosed as asthmatic. I wear Brooks shoes for most of my running (PureFlow, PureCadence or Vapors). However, I wear Salomons for trail/cross-country running. I had dancing lessons from 5-21 and was particularly proficient at tap dancing. What advice would you give to your sixteen-year-old self and why? What’s the best fitness hack/training tip that anyone’s ever shared with you? What one thing would you change about your job and why? Are there any sports that you’ve tried and hated? If you had £1million to donate to charity, which one would you choose and why? Do you make and keep New Year’s resolutions? Where in the world is Jess?